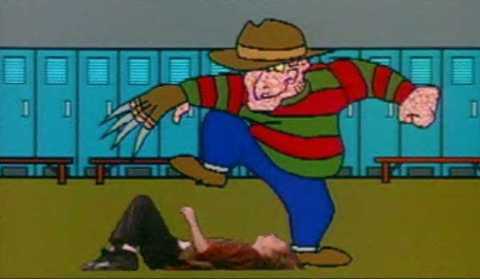 Ten years after the events of The Dream Child, Freddy Krueger has essentially bled Springwood dry, killing off all but one teenager. This kid, an amnesiac known as “John Doe,” ends up at a youth shelter in a neighboring community, where his stories of horrifying dreams attract the attention of child psychologist Maggie Burroughs…herself plagued by strange nightmares that seem to share some characteristics with John’s dreams. Figuring out that both their dreams contain visions of Springwood, Maggie and John (along with three young stowaways from the shelter) return to the town, where they discover too late that this was all a trap set up by Freddy, to both get back the child once taken from him, and to escape the confines of his now child-less hometown. If Hutz had been smart, he would have expanded his suit to also cover any long-running horror franchise that dared to advertise a supposedly “final” chapter. Hell, Friday the 13th offered up not one but two movies with the “final” designation. And guess what? They lied both times! Of course, it wasn’t really to the surprise of anyone, as fans of the genre have long been hip to this trick. 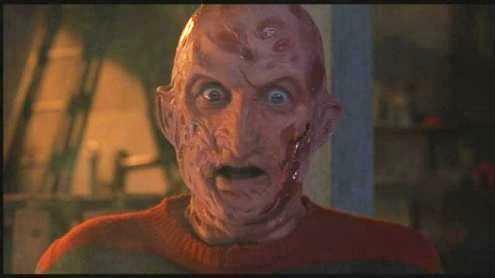 I doubt many out there really bought a ticket to Freddy’s Dead thinking it would be the last they’d see of Mr. Krueger. Still, it made sense for New Line to position the film that way at the time. While A Nightmare on Elm Street 4: The Dream Master had been a box-office smash, the follow-up film, The Dream Child, saw a steep decline just one year later– making $27 million less than the fourth entry. It was a clear sign that both Freddy’s undeniable overexposure and the declining quality of the films had led to increasing audience apathy. I doubt New Line really wanted to end the franchise permanently, but it was pretty apparent that a nice long break, at least, was probably a good idea. Freddy reads the reviews for The Dream Child. Billing the film as the final entry not only ensured a big-event feel, but it would also hopefully lead to an “absence makes the heart grow fonder” attitude amongst the fan-base. Kill off their favorite villain, make them believe he’s gone for good, and then sit back and wait until their demand for Freddy’s return reaches a boiling point. Of course, there was one thing New Line had to do first to ensure this plan would work – make a good movie. The obvious approach would have been to try to lure back series creator Wes Craven – or at least a somewhat like-minded director – to return the series to its darker, less-comedic roots, thus allowing this supposedly last film to send Freddy out on a horrific high note. First, they hired director Rachel Talalay to helm the film. On one hand, it seems an odd move to put such a high-profile film in the hands of a first-time director, but it actually makes an appropriate sort of sense when you consider that Talalay had been involved with the series since the beginning, starting out as an assistant production manager on Craven’s original movie and eventually working her way up to producer by the later sequels. Whatever you might think of her work on this film, I think it was kind of cool that New Line showed that level of loyalty, and I can appreciate their attempt to keep the Nightmare series something of a “family” affair. That being said, it’s tempting to wonder what might have been if Talalay hadn’t taken the job. After all, it was she that decided against using the original script by Michael Almereyda, which saw Alice’s son Jacob now fully grown and battling Freddy with the aid of the spirits of A Nightmare on Elm Street 3‘s Taryn, Joey, and Kincaid, now dubbed the “Dream Police.” Having not read this script, I can’t say for sure whether it warranted the intense dislike Talalay felt for it…but I’m not gonna lie and say I don’t feel a little cheated knowing we were denied the return of Kincaid. The rematch that never happened. Oh, what could have been. Talalay also rejected a script by a then up-and-coming Peter Jackson, before finally settling on a screenplay by Michael De Luca. 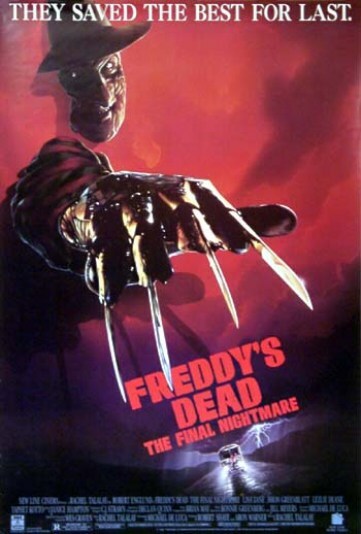 Now, this wasn’t entirely out of left field or anything – De Luca had written several episodes of the Freddy’s Nightmares television series, and was also responsible for the final polish on the Dream Child script. So, no, he was no stranger to the Nightmare universe, but still…the conspiracy theorist in me can’t help but wonder if his position as a high-ranking New Line executive at the time didn’t maybe have a little bit more to do with this than the quality of his script itself. To be fair, though, I can see why De Luca’s script probably seemed intriguing to Talalay. Shedding the perhaps overwhelming continuity shackles of the last three sequels was arguably a good move, allowing the new film to finally open up the story’s universe a little more. Given the earlier representation of Springwood as an idyllic little town (only tarnished by the occasional spate of unexplained teenage deaths, of course), it is pretty cool to see it presented as a now devastated, near-barren wasteland, thanks to Freddy’s overwhelming influence. It’s really the first time the series ever acknowledges just how devastating the events of the previous films would have been on the community, and it allows Talalay to bring a weird David Lynch-ish vibe to the scenes set in the town’s sorry excuse for a Town Fair. 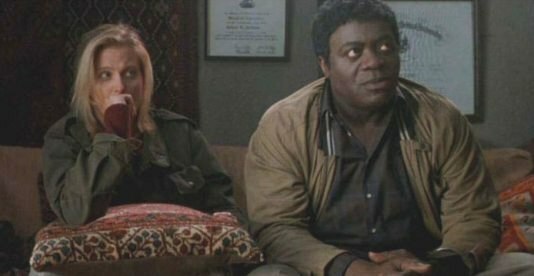 Plus, a Roseanne cameo…arguably the film’s scariest moment. 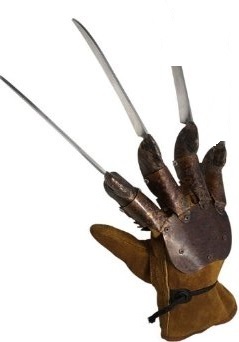 The peeks into Freddy’s past are also a nice addition for a film proclaiming to be the final word on the character, allowing a little more info on the character without contradicting what we already know (even if some of the elements are somewhat asinine, like suggesting that Freddy’s post-death vengeance was because of his anger over losing his daughter, or revealing that his powers were a gift from a pack of talking, floating “dream demons”). And, although I don’t really like that both this series and Friday the 13th felt the need to introduce an as-of-yet unknown relative as the only person who can truly defeat the villain (it’s all Halloween‘s fault, I tell you! ), I’ll concede that the stuff with Maggie’s mysterious dreams, her discovery of who she really is, and her eventually coming face-to-face with her legacy is fairly strong stuff thematically – maybe not so much in execution, but still. Doe’s death probably should have been math related, as it’s obviously his biggest weakness. All in all, De Luca’s script is full of little touches that give the movie its own unique identity from the previous sequels, thus allowing a director to clearly put their own personal stamp on the series. So, yeah, I get what Talalay saw in it. But, then again, maybe she just liked how damn wacky it was. And wacky it is. 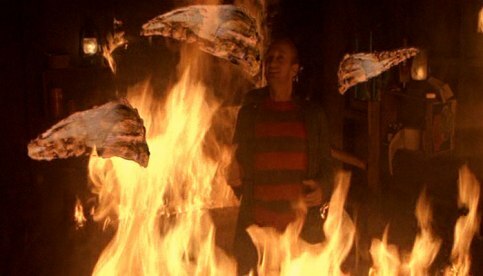 Freddy’s Dead, rather than the intense return to Craven’s dark nightmare that I said this film should have been, is in fact the stupidest, goofiest film in the entire series. It takes whatever small bit of actual horror might have been left in the series and tosses it right out the window, instead turning the franchise into a live-action equivalent of a Warner Bros. cartoon, complete with wacky sound effects, broad humor, and a version of Freddy so over-the-top that he might as well have been tying girls to railroads and twirling a Snidely Whiplash moustache. I don’t hate this movie. Oh, a part of me knows I should. I mean, I totally get the negative feelings others have toward it, and I don’t dispute most of the criticisms thrown its way. But the fact remains, some of it actually works for me. If I can be so bold, I’ll even go so far as to say I kind of enjoy the tone it was going for. 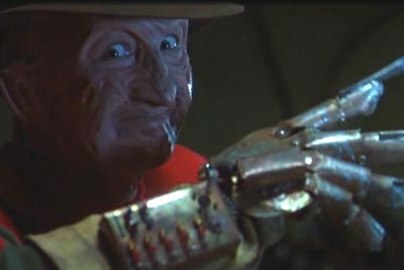 The way I see it is, for a good portion of its running time, Freddy’s Dead actually works as an amusing parody of the Freddy Krueger character and the earlier films. Robert Englund has said as much, as well, suggesting in his autobiography that the Freddy’s Dead filmmakers were trying to present a self-mocking send-up of Freddy and his impact on popular culture. True, that could just be a little after-the-fact spin control, but whether it was really intended or not, the movie is at times a pretty effective lampoon of both the slasher genre in general, and the Nightmare series in particular. Many might argue that the supposed last film in a series once so deadly-serious really shouldn’t be switching over to self-parody, but in this case I say, why not? It’s only bringing what the last couple films started full circle – the series had been heading in the direction of pure comedy for awhile; Freddy’s Dead just had the balls to finally pull the trigger once and for all. And that’s just it – if you’re wondering why I can commend this film’s more lighthearted nature after complaining about the more humorous moments in the last couple movies, it’s because this one finally just goes all out with it. 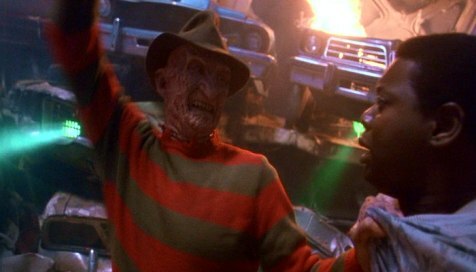 The problem with The Dream Master and The Dream Child was that they were tipping Freddy too far over into the comedic side of things while still trying to keep the movies themselves somewhat serious and scary. It was an awkward mix, and never really worked. Freddy’s Dead, on the other hand, never really seems to have any interest in trying to be frightening, and it sure as hell ain’t trying to be serious. This film is very much a response to what was done to Freddy in the previous movies – it takes the “Freddy as clown” ball and runs with it, turning the whole thing into one big joke. 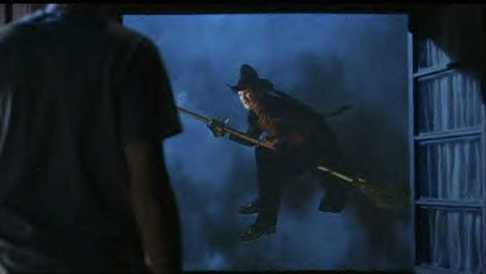 This can even be seen in it’s use of undeniably distracting cameos from the likes of Roseanne and Tom Arnold (as a couple of nutty Springwood residents), Alice Cooper (as Freddy’s drunken foster-father in a flashback sequence) and – in a great bit – the original Nightmare‘s Johnny Depp, here billed as “Oprah Noodlemantra” and on-hand for an amusing take on the “this is your brain on drugs” ad-campaign that was big at the time. Freddy’s Dead is obviously aware that Freddy is no longer scary; thanks to what the last couple sequels did to him. Sure, the filmmakers could have tried to restore him to the terrifying monster he once was, and maybe they would have ended up with a better movie had they been successful. But they probably felt the damage was done and it was a lost cause. So instead they just turned up the ridiculousness to an insanely high degree. Yes, things like Freddy flying on a broomstick while cackling like a witch or killing a stoner in a Freddy video game (complete with his own Power Glove) are incredibly stupid…but I think the movie knows they’re stupid. Englund sure seems to, at least, as he really goes overboard this time – after a somewhat flat performance in the last film, he’s noticeably having a ball with the sheer outrageousness of this one. And call me crazy, but if you can get into the anarchic spirit of it all, you might just share his enthusiasm…at least for awhile. I say “for awhile” because, admittedly, any moderate goodwill that is built up by the genuinely entertaining first half of the film is ultimately undermined by an absolutely wretched final act. This can be at least partly attributed to New Line’s gimmicky decision to stage the climax in 3D…and we’re not talking Avatar 3D here, either. This is old-school, crappy 1991 red/blue 3D. Even for the time, this film’s 3D FX are pretty sub-standard, and thus look even worse when viewed in 2D if you’re not “lucky” enough to have the 3D version of the DVD. 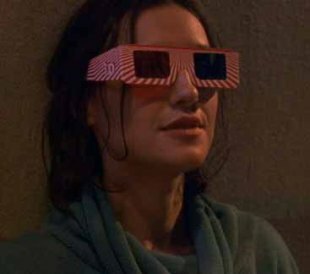 Besides that, the movie’s method of letting the audience know when to put on their glasses is beyond idiotic – Maggie is given a special pair of 3D glasses that apparently give her some sort of extra powers in the dream-world. Come again? And just what the hell does she mean when she comes out of the dream and is amazed that “I’m still seeing things like I was in my dream?” Um, yeah…you always see in 3D, moron. But even overlooking the 3D element, there’s no excuse for how anti-climatic Freddy’s “death” ends up being. Now maybe they really weren’t planning on this being the end, but they were at least pretending it was, and so they should have felt obligated to deliver one hell of an awesome climax. I find it hard to believe this was the best they could come up with. The poorly staged brawl with Maggie that precedes it is bad enough, but Freddy’s final moment is just inexcusable. Freddy may have been nothing more than a joke at this point, but he still deserved a little better than to be supposedly sent to his final resting place by (spoiler alert) some ninja stars and a pipe bomb. I mean, really?? That’s what we’re supposed to believe these six films were leading up to? Look, I’ll be the first to admit that, besides the awful last act, there are a lot of other problems with this movie – there’s Freddy’s make-up once again looking terrible (I’m convinced they were softening his image so that he would be less scary to kids), there’s the absolute waste of Yaphet Kotto’s talents, and there’s Lezlie Deane’s grating performance as Tracy, one of the more annoying characters ever featured in a Nightmare film. And, hey, in the end, I’m not claiming this is a very good movie or anything. I just think a lot of the hatred towards it stems solely from it selling itself as the final Nightmare film, while it’s nowhere near cool or creative enough to seem to earn that special distinction. 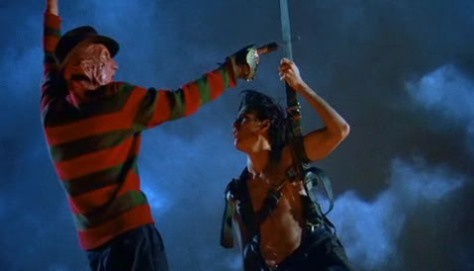 But, let’s keep in mind that this wasn’t the end of Freddy, not in the long run. If you choose to view the film not as the last word on a once groundbreaking character, but instead consider it a playful send-up of the series’ slow descent into pure camp, then it actually has it’s fair share of entertaining moments. If nothing else, I’d gladly watch this over parts 2 and 5 any day. 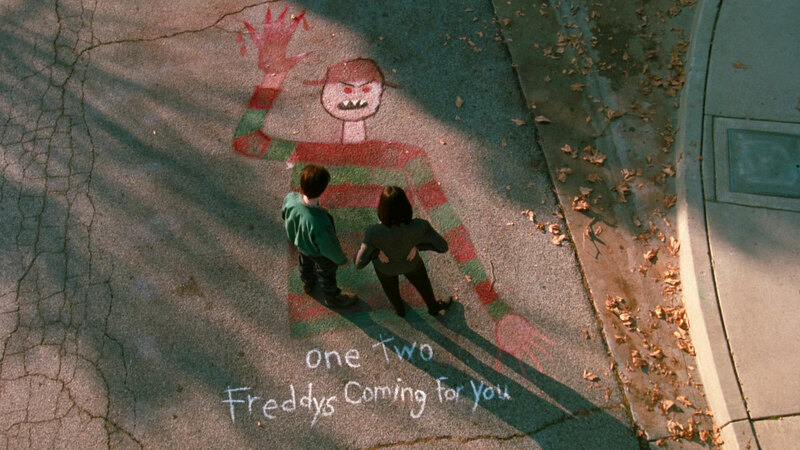 For the second film in a row, Freddy racks up a surprisingly low body-count of three. I know they wanted to use the majority of the running time to focus on the back-story and all that, but c’mon…is that really how you’re gonna let Freddy go out? With just three kills? I’m tempted to say the living video-game death of Spencer (Breckin Meyer, in his movie debut), just to piss off the folks that really hate this film’s silly attitude. But instead I’ll be honest and give the honor to Carlos (Ricky Dean Logan). From the moment we find out that Carlos is deaf in one ear (thanks to a beating from his mother), we just know that’s going to play into one of his nightmares later. Sure enough, Freddy first robs him of his hearing entirely, before then fitting him with an overly-sensitive hearing aid that makes even the slightest sound head-splittingly loud…literally. Like the rest of the film, it’s a pretty goofy sequence, with Freddy playing to the audience as he taunts the deaf Carlos – Englund plays the scene so big that I’m surprised celluloid was able to contain his performance. Still, it’s a pretty clever and inventive sequence, one that wouldn’t have felt out of place even in a better film like Dream Warriors. Posted on December 7, 2014, in A Nightmare on Elm Street, Franchise Post-Mortems, Reviews and tagged A Nightmare on Elm Street, Freddy Krueger, Horror Movies, Johnny Depp, Robert Englund, Slashers. Bookmark the permalink. Leave a comment.